WD's Livewire Powerline kit's designed for AV streaming | What Hi-Fi? Selling for £90, the package uses two adapter units designed to connect to sources, routers and client units via Ethernet, and send and receive data over the home mains wiring. 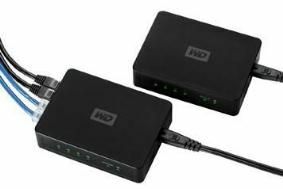 But where the WD solution differs from others on the market is in the provision of four ports at each end of the chain, allowing NAS drives, a router, and client devices such as TVs, streaming systems, and Blu-ray players to be connected. Along with the router, up to seven devices can be connected, three at the router end, and an additional four at the remote location, which the company suggests would typically be at their home cinema system. Rather than the usual plug-top Powerline design, the WD system uses desk-top boxes connected to the mains using conventional power cables, and is said to give speeds of up to 200Mbps, making it suitable for carrying multiple 1080p HD video streams. The arrival of the Livewire package means WD can now offer end-to-end streaming systems from NAS drives to media players, and with a choice of wired Ethernet, wireless or Powerline connectivity. The WD Livewire Powerline AV Network Kit has is available now at select retailers and WD's online shop.